Our first day at The Lodge at Pico Bonito will begin at 6:00 AM, with an early breakfast/orientation on the spacious front deck of The Lodge’s Itzama Restaurant. For the next several hours our guide will lead us throughout the Lodge grounds, spotting numerous bird species that are common in the early hours. A climb to the top of the “Toucan Tower” observation platform offers a bird’s eye view of the forest canopy that can include heart-stopping views of the coveted Lovely Cotinga. Throughout the morning we will bird areas of tropical, secondary and gallery forest and plantations along the Rio Coloradito. Along this route, diversity is the rule, and examples of sightings include Lovely Cotinga, Masked and Black-crowned Tityras, Blue-crowned and Turquoise-browed Motmots, Tody Motmot, Keel-billed Toucan, Collared Aracari, Ferruginous Pygmy Owl, Black-cowled Oriole, Black-headed and Violaceous Trogons, Collared and Slaty-tailed Trogons, Royal Flycatcher, Green, Shining and Red-Legged Honeycreepers, and 16 species of Hummingbirds including Crowned Woodnymph, Blue-throated Sapphire, Violet Sabrewing, Purple-crowned Fairy, Stripe-tailed Hummingbird, Brown Violet-ear, Green Violet-ear and White-necked Jacobin. Cuero y Salado Wildlife Refuge is named for the Cuero and Salado Rivers which meet the ocean here. The Refuge comprises over 35,000 acres of rivers, lagoons, mangroves, and forests that are home to diverse wildlife and a variety of birds exceeding 350 species. We’ll meet our guide early for breakfast, and depart for the refuge by 6:30 AM. Access into this wilderness is via a small motorized train which takes us along a century-old track through bird-rich ranchlands, marshlands and plantation areas, ultimately arriving at the mouth of the Salado River and the refuge itself. Birding from the train is always exciting, as even the conductor is eager to stop and point out species of interest along the way. Depending on season, a variety of raptors, wading birds and edge-habitat species abound along the railway. Once at the refuge, we will explore the various aquatic and forest habitats from a small, motorized skiff. Our guides and boat handlers are superbly trained spotters and, when needed, prefer to silence our boat’s motor and quietly paddle in for a better look. Agami Heron, Boat-billed Heron, Bare-throated Tiger Heron, Yellow-crowned Night-Heron, Tri-colored Heron, Jabiru Stork, Pygmy Kingfisher, Gray-necked Wood Rail, Sungrebe, Laughing Falcon, Bat Falcon, and Lesser Yellow-headed Vulture are but a few potential highlights of a visit to Cuero y Salado. During the right season (Feb. – March), we may also have the opportunity to visit an established Boat-billed Heron rookery, consisting of several hundred pairs of these broad-billed, wide-eyed, bill-clapping mangrove inhabitants. We’ll meet our guide for breakfast and depart for The Lancetilla Botanical Gardens by 5:30 AM. Set amidst a coastal valley flanked by low, rain-forested hills, The United Fruit Company founded Lancetilla as a station where tropical fruit and wood trees were studied for commercial value. The Gardens were founded in 1925, and some of that work continues, but this diverse tropical treasure, composed of a mosaic of forest and edge habitats, is today best known for its superb birding. 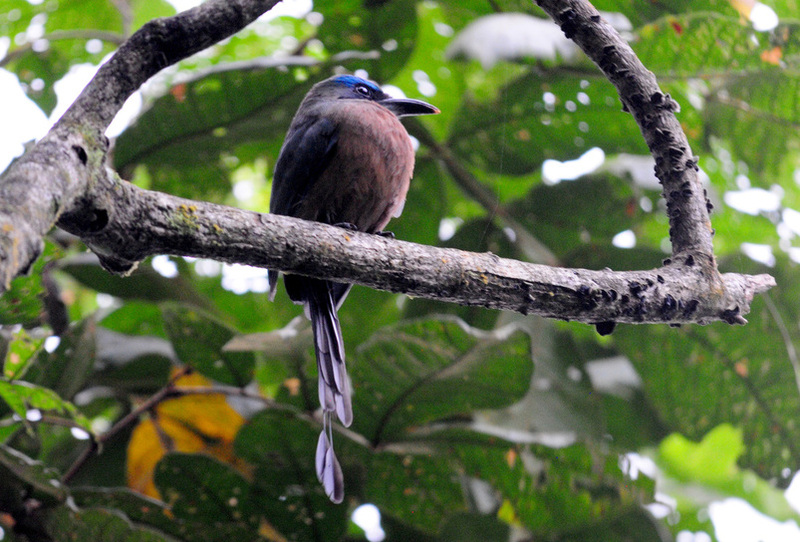 Honduras' annual Christmas Bird Count is held at Lancetilla. Every December, birders flock to confirm (and add to) the Garden’s growing list of colorful, tropical species. The current bird list reads like a who’s who of tropical birds, and includes Motmots and Manakins, Woodcreepers and Warblers, Woodpeckers, Toucans, Tanagers, and scores of others. Thanks to this diversity, a typical day of birding here could yield Little Tinamou, Common Black Hawk, Ornate Hawk-eagle, Ruddy Crake, White-fronted Parrot, Red-lored Parrot, Squirrel Cuckoo, Black-headed Trogon, ViolaceousTrogon, Collared Trogon, Turquoise-browed Motmot, Blue-crowned Motmot, Rufous-tailed Jacamar, Great Antshrike, Barred Antshrike, Long-billed Gnatwren, and a host of other resident and migrant species. We’ll complete our morning at Lancetilla with lunch in the beach town of Tela, and return to The Lodge by late afternoon. Deposit of $600 with registration (link for registration form is at the bottom of this page). Balance is due on or before October 14, 2015.